SBC was featured as a part of the SHC Pride video series, celebrating 40 years of service to the Bay Area and excellence in supporting research, transfusion and transplantation medicine. Stanford Blood Center was created within the Department of Pathology at Stanford University School of Medicine in 1978. The Blood Center was created to meet the increasingly large and complex transfusion needs of Stanford Health Care and Lucile Salter Packard Children’s Hospital at Stanford, and to perform research and teaching. As an academic blood center, we were able to match the resources of a world-class university with the operational demands of a rapidly growing, innovative health care system. Our labs led the field in research and testing services, and our leadership were responsible for initiating many of the procedures and safeguards of the blood supply that are considered industry standards today. As transplantation medicine began to evolve, our HLA (Human Leukocyte Antigen) Lab pioneered numerous transplant monitoring and compatibility methods, and promoted cutting-edge technologies that have made precision heath care and advanced data gathering possible. From the beginning, we have been out front on industry challenges by being ready with testing well in advance of a public health concern. Our mindset has always been one of prevention, preparedness and safety of the blood supply. As the needs of the transplant and transfusion industries have grown increasingly complex, and as our hospital partners have increased in scale and numbers, we have expanded to meet demand, while maintaining our dedication to the well-being of the community and patients we serve. We remain an independent community blood center and leader in the fields of transfusion and transplantation medicine. As of October 2015, we have created a powerful alliance with Stanford Health Care (SHC), which has further expanded our impact on clinical care. The Blood Center has developed a large automated blood collection program, including double red blood cell collection and multiple plasma product collection, in response to the growing needs of hospital programs targeting oncology, bone marrow and solid organ transplant. We serve some of the most complex transfusion and transplant programs in the United States, with a wide array of specialized products and services. Our Special Donations Department is dedicated to responding to the special needs of autologous, directed, and therapeutic donors, and our Donor Services Department continues to adapt to the ever-changing needs of the ethnically diverse patient population. We maintain partnerships across a wide variety of community organizations and local businesses, in order to foster community education and awareness, and to connect local donors with local patients through a robust mobile blood donation program. 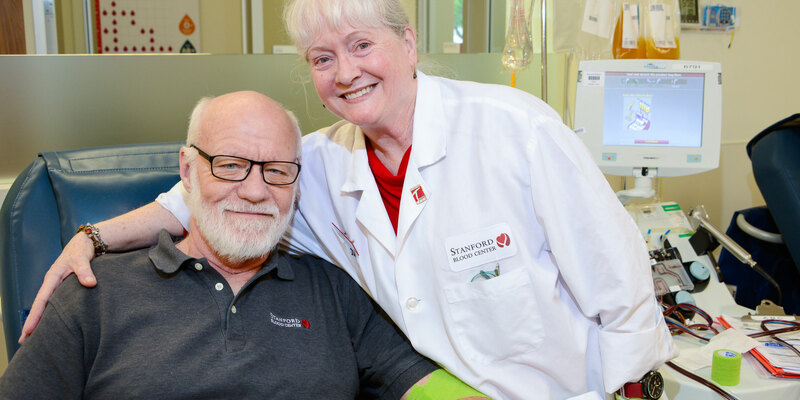 The history of the Blood Center is replete with milestones in transfusion medicine, particularly in the areas of blood safety and compatibility testing. Stanford Blood Center was the first in the world to test routinely for cytomegalovirus (CMV) and provide CMV negative blood for immune-compromised transfusion recipients. Stanford Blood Center was among the first in the country to provide HLA-compatible platelets. In 1983, Stanford Blood Center was the first blood center to screen for AIDS contaminated blood, using a surrogate test (T-lymphocyte phenotyping) two years before the AIDS virus antibody test was developed. In 1987, Stanford Blood Center was the first in the country to screen donors for Human T-Lymphotropic Virus Type I (HTLV-I), a virus believed to cause a form of adult leukemia. In the early 1990’s, Stanford Blood Center’s founder and medical director, Edgar Engleman, MD, developed the methodology behind the first FDA approved cancer vaccine for advanced prostate cancer — a treatment that trains the body’s own immune system to fight cancerous tumors. This treatment has the potential to fight other types of cancer as well. Currently, we are among the few blood centers in the country to use a research test to differentiate between HTLV-I and HTLV-II. These achievements represent the outcome of a close working relationship between research and clinical personnel, and the integration of the research labs with the Blood Center and Transfusion Service clinical programs. For a visual snapshot of these and many other SBC milestones, visit our timeline! We are proud to have a dedicated team of talented individuals who are excited to come to work every day and help others. Our team members truly make an impact both locally and globally through the work they do at SBC.